Today,"Ninja"s are well known in all over the world. By the way, actually, who are they? In old days,when Japan had been separated in many countries, the professional spies, who stole secrets of enemies, were Ninjas. We are going to introduce ,what Ninjas had really been , that only few people know. Can ninjas really control illusions? One of the things that makes people feel that ninjas are so mysterious is the controlling of illusions. In films and anime we often see such scenes. Just after ninjas cast spells making symbolic signs with their fingers, ninjas soar to the sky and fade away, or disappear leaving only smoke… Did real ninjas truly have such techniques and if so, were they the kind of witchcraft that wizards use? The answer is that ninjas actually harnessed skills called " Genjutsu (幻術) ", but the principles of genjutsu were not something supernatural like witchcraft, but like magic that magicians use with tricks. In " Bansen-shukai (萬川集海) ", which are the old documents about ninjas and ninjutsu (忍術) , there are no descriptions about genjutsu. It is said that genjutsu does not necessarily belong to regular ninjutsu, however it is true that there are a lot of legends and evidence which show that ninjas really made their enemies confused through illusion. What do we think about these facts? The hypothesis is that, there were a few ninjas who could utilize illusions in actual warfare. I want you to remember that the ancestors of ninjas are various outsiders, like aborigines of Japan, pagans, and political losers. Among these people, there may have existed some who mastered " sangaku (散楽) ", which was a performing art from the continent. There is a possibility that those people could use illusions and the techniques became genjutsu. It can be thought that for ninjas, the meaning of genjutsu mainly consisted in the fact that genjutsu was very useful when ninjas were disguised as street performers like " Sarugaku-Shi (猿楽師) ", rather than in deceiving their enemies by illusion in real battles. Of course, we cannot any find scientific theory about genjutsu in any records at all. As after the heyday of ninjas, their activities were often told with exaggeration in " Kodan (講談) ", or " Kabuki (歌舞伎) ", the mystique of genjutsu must have been exaggerated greatly. Actually, ruined ninjas often became street performers or magicians but the roots of street performance and magic in Japan exist in Sangaku. So, we are going to look at what sangaku is in detail. What is " Sangaku " ? It is said that " sangaku (散楽) " was born in western regions of China before 0 BC. Sangaku is composed of a lot of performances like mimicry, acrobatics, acrobatic magic, puppet operating, dancing and illusion. It can be thought that sangaku was created from a mixture of many popular performing arts from many areas like ancient Greece, ancient Rome, central Asia, and western Asia. " 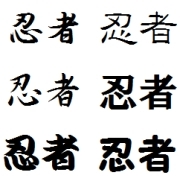 Sangaku (散楽) " means irregular arts in Chinese characters. The reason is that when sangaku was transmitted to China, sangaku was more flexible than the court music of those days. It is said that sangaku was introduced to Japan in the " Nara-period (奈良時代 AD 710-794 ) " . At first, sangaku was public entertainment in the Japanese Court but gradually performing sangaku in the court began being prohibited because it was thought to be indecent. Instead, sangaku was spread among the public and eventually sangaku became the base of almost all traditional arts, on behalf of all the traditional arts of Japan continued to today, like " Sarugaku (猿楽) " , " Denraku (田楽) " , " Nou (能) " (such as Sarugaku (猿楽) " , " Denraku (田楽) " and " Nou (能) "). (By the way, “Sarugaku” is the dialect way of saying “Sangaku”) . As " Sarugaku " is the base of " Nou" , the speciality of Sarugaku is in its humorous imitations and speaking. No was loved by " Daimyos (大名) " in the Warring States period so it was so convenient for ninjas to disguise themselves as Sarugaku-Shi as they approached the hostile daimyos. The mystique of genjutsu did not seem to be found at all. Weren’t there any ninjas who used mysterious skills of illusion? Yes, there were some ninjas with legends about their use of illusions. 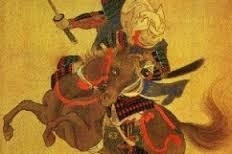 It is hard to distinguish the truth about such legends but I am going to tell you about the life of " Kato, Danzo (加藤 段蔵) " a ninja who made full use of illusions. "Kato Danzo " called " Tobi-Kato "
" Kato, Danzo (加藤 段蔵) " was a freelance ninja in the Warring States period, during the 16th century. He was called " Tobi-Kato " . " Tobi " means " to jump " in Japanese. According to the nickname, Danzo was good at acrobatic ninjutsu (忍術) . The biography of Danzo is not known in great detail, where, when and how he learned ninjutsu remains a mystery nut in accordance with the legend, Danzo was looking for the lord under whom he worked for. 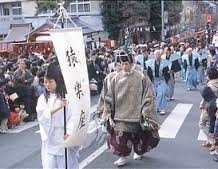 One day in Echigo (越後) , which was ruled by a famous strong daimyo " Uesugi, Kenshin (上杉 謙信) ", Danzo gathered people and demonstrated his genjutsu. Legend has it that he swallowed the whole body of a cow. The show succeeded and all of the audiences were surprised at the scene. But a certain man on a pine tree who had watched the exhibition, exposed the trick as an illusion. Danzo got angry and began to blow buds of moonflowers with a fan. Just after that, the stalk of the moonflower started to grow upwards rapidly and it grew about 60 cm with flowers and fruits. Then, as soon as Danzo cut off the calyx with his short sword, the freshly severed head of the man on the pine tree fell onto the ground. Thanks to the demonstration, Kenshin had great interest in Danzo and gave him a test upon hiring him as an exclusive ninja of Kenshin. Kenshin ordered Danzo to steal a treasure kept in the residence of a certain statesman belonging to Kenshin. In spite of the heavy number of guards, Danzo succeeded in stealing the treasure. Then, Danzo got carried away and brought even a maid over, who was working for the statesman. Danzo lost his credit with Kenshin because of the affair and Danzo was banished from Echigo. Secondly, Danzo went to Kai (甲斐) which was next to Echigo and governed by " Takeda, Shingen (武田 信玄) ", who was famous as the rival of Kenshin. Danzo hoped to be hired by Shingen there but Shingen did not trust Danzo and did not employ him. Danzo stole a heirloom of the Takeda-family in revenge. This act was his undoing. Danzo was killed by a ninja who had been given the order from Shingen. This proved that ninjas demanded the loyalty to their lords and teamwork was paramount. Even a ninja with excellent stealing and illusions skills couldn’t live as a ninja in the Warring States period in Japan.